Workplace automation is a big buzzword these days – there are 100s of different programs and products that aim to streamline every aspect of your life, from your lightbulbs and your coffee machine to doing your job and paying your bills. Property management and residential leasing automation has come a long way in recent years, making it easier to handle every aspect of residential leasing from communication with your community to maintenance requests and rent collection. In this blog, we’re going to dive into what’s new with residential leasing and show you how ShowMojo is taking steps to keep improving the lives of property managers. Chances are, you’re already toeing the water of property management automation because you’re already using a property management software that automates portions of your company’s workflow. They typically offer services that automate your accounting tasks, track your property maintenance and even facilitate tenant communication. If your property management software offers leasing automation, it’s usually second-rate at best. We won’t name any names, but many popular property management programs allow you to enter your listings in, then they may take over and help you distribute them around the internet so that you can work to find new tenants. Once you find your tenant, your property management software may help you get your lease signed, collect rent and disseminate community news. These tools are hugely popular in the residential leasing industry due to the weight they lift off your shoulders when it comes to getting your leases signed. However, if you look back at that last paragraph, there is a glaring gap in coverage that still leaves you with a lot of work on your hands. Property management software helps you manage your property – that’s it – they don’t help you find your tenants. That glaring gap of finding new tenants leaves your leasing team with countless hours of work that could make scaling your property management company arduous and labor intensive. 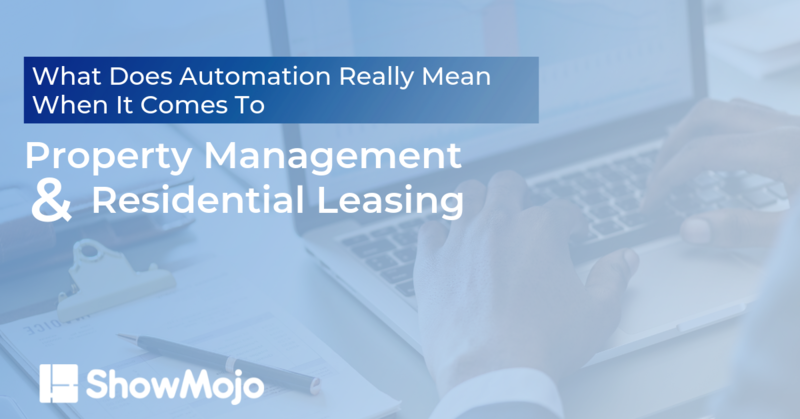 If you want to implement leasing automation for your residential property, you’re going to need to do better than just a property management software. You need a platform that will automate the hard parts of finding new tenants. Imagine a smart software that answers your calls, emails and texts from prospective renters, schedules and confirms your showings and then follows up with your prospects, all without you lifting a finger. That’s where ShowMojo steps in. At ShowMojo, we have a vision for the perfect tenant prospecting process – it’s automated but flexible, rigorous but intuitive. We understand the struggles of property managers and rental property owners because we are rental property owners. We struggled with the time constraints involved with finding new tenants, so we did something about it. Allow us to introduce you to prospect-driven leasing. Prospect-driven leasing is the idea that you don’t have to be the one to drive the leasing process forward. Instead, ShowMojo automates your part in the prospecting process and puts the work in the hands of your prospective tenant. Starting the Leasing Journey – Your prospective renter searches online for a home for rent near them. It doesn’t matter if they start on Google or go straight to sites like Zillow of Apartment Finder, ShowMojo has already syndicated your listing just about anywhere a property can be listed. Self-Screening – Your prospective renter performs their own pre-screening, taking an online interview set up with the questions that are important to you. If they’re qualified they move onto step three, if they’re not qualified ShowMojo will let them know and won’t let them move on. Schedule a Showing – Qualified prospects will be allowed to choose a time from your schedule to see your rental property. You can choose to allow showings however you prefer – group showings, lockbox-based self-showings, one-on-one leasing agent showings – whatever works best for you. Automated coordination – ShowMojo automates communication coordination between everyone involved so ShowMojo will let you know when the showing is scheduled and let anyone currently living in the property know to plan for a showing. Whether communication happens via phone call, email or text message, ShowMojo handles that for you and just lets you know when you’re scheduled to show. Simple Updates – If you or your prospect needs to change, reschedule or cancel a showing, ShowMojo handles that communication for you too, even offering other times on your calendar to reschedule. Confirmations – ShowMojo’s rigorous confirmation process will follow up with your prospect from 24 hours before the showing. If they don’t confirm, their showing is canceled, so you’ll never have to deal with a no-show again. Showtime – Here’s where the good stuff happens – it’s showtime! Whether you prefer traditional one-on-one agent-lead showings, group showings or lockbox-based self-showings, your prospect attends their showing and falls in love with your property. Follow Up – After the showing, ShowMojo follows up with your prospect via email or text with whatever follow-up messaging is important to you. Feedback – ShowMojo will ask for feedback from your prospects to provide you with insights on how prospective tenants feel about your properties and leasing agents. Nurturing – ShowMojo will nurture your prospects by automatically emailing them when rent is reduced or when you have similar properties become available. Application – ShowMojo will continuously encourage the prospect to apply. You can set up your prospecting process to utilize your own online application or ShowMojo can set one up for you. Did you notice who did all the work in this scenario? The prospect. That’s how leasing works with ShowMojo’s leasing automation. It fills in the blatant blanks missing with your run-of-the-mill property management software and automates the most time-consuming parts. With ShowMojo you’ll never have to answer another call, text or email from prospective tenants. We hear a lot of concerns from property managers about the rigidity of automation in their company. Many leasing automation products on the market offer a one-size-fits-all solution. These concerns are so important – an automation system for your property management business should make life easier for you, not more complicated. We understand that when you’re trying to meet the needs of every type of property with one out-of-the-box software, you’re not going to meet the needs of anyone. When you work with ShowMojo, you work with a customizable platform that can be adjusted at every step of the way to meet your property’s needs. Automation doesn’t have to be rigid – with ShowMojo it’s totally customizable to your company’s needs. Whether you’ve got a 10-man strong leasing team or you’ve got yourself as your leasing team, our solution is adaptable to meet your property’s unique needs. Want to learn more about ShowMojo’s automated leasing solution? 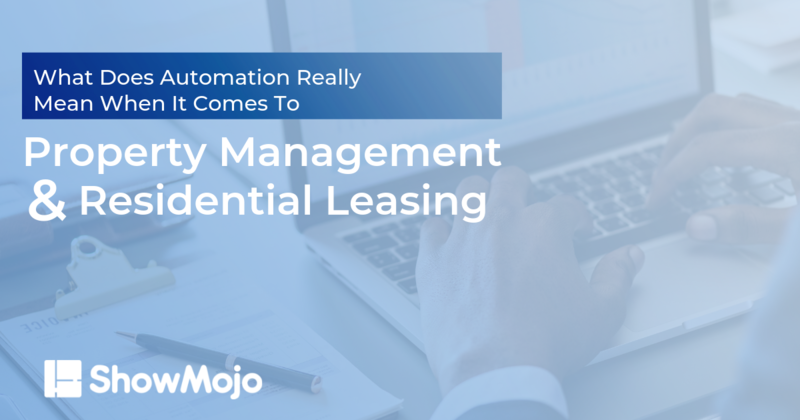 We’d love to learn more about your business and show you how ShowMojo’s leasing automation solutions will change the way you prospect your next tenant. Click here to schedule a demo or dive right in and see for yourself in a free 14-day trial. PreviousPrevious post:Three Tips to Grow Your Multifamily Property Management BusinessNextNext post:Who’s Your PRIMARY Showing Agent?